The winter of 2013 to 2014 has seen the longest spell of flooding the country has known. Let's be clear, most Britons are perfectly safe, and very few died in the floods, but there are certain areas that have had real problems. These are mainly in the south and west,along with parts of Wales. 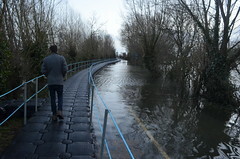 In particular one area that has been badly hit is the Somerset Levels. These are flat, low lying areas of South West England, where an area of about twenty five square miles has been under several metres of water for over a month. The nasty snows that befell America over the winter of 2013 -2014 were only one end of an Atlantic wide problem. What the USA got as snow, we in Britain got as rain, lots of it, the wettest January for a hundred years; and one area of the South West is still under water, having endured a month of flooding. I had better explain the meaning of the word levels. In British place name usage, levels are areas of low lying flat land, invariably prone to flooding; and there are none more prone than the Somerset Levels. Somerset is a county of South West Britain, whose name means the Land of the Summer People. The meaning of this term becomes clear, as it indicates that in Anglo-Saxon times the land was uninhabitable in winter, but its floodable land was rich for pasture, so the Saxons spent Summer there to feed their cattle. The Geography is simple. Most of the Levels are up to two feet below sea level, and were in ancient times an area of small islands in a swamp. All settlements were on islands. For example, the stranded village of Muchelney, which has been cut off for a month and having to be supplied by by boats launched by the fire brigade and now the armed forces, has a name that means Big Island; and the nearby village, also cut off by flood water that can be two or more metres deep, is Thorney, a name that means Thorn Island.You can see what these places once were islands that were marvellous defensive sites in times of Viking raids, for the long boats could not navigate the swamps.Over the centuries the villages have lost their island status [and fortunately there are no longer Vikings] and have become typical English villages, desirable places to get a property and retire: until now. The process of draining began with the mediaeval monks. who farmed crops and fished for eels in the area, many belonging to the great abbey of Glastonbury. After the monks were driven out a lull occurred until the seventeenth century, when Dutch engineers were hired to drain the land for farming. There are still Dutch surnames in the area. The drainage was completed during the Second World War, when Britain was in dire need of food, and people were digging for victory.So now we have a rich and fertile area of England, a picture of the landscape of England as we dream it to be, rich and green, fertile and well farmed. But endangered. The problem facing the residents and farmers of this lovely area is that sea levels are rising and in Western Britain storms are becoming more common, as has been predicted by climate change scientists. This means that the Levels are becoming more floodable. There is also another problem. The Levels drain a surrounding area of land far larger than they are. I recall camping in an orchard on a hill above the Levels and looking down on the flat land stretching into the distance. Very beautiful, but also wet. 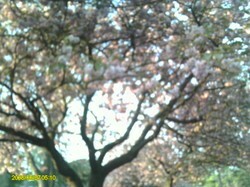 The dampness of the air made for cold night in a tent on the April weekend when I camped there, all too many years ago. The area is being maintained in an artificial state. The land can only remain dry all year round if the water is constantly enabled to flow out. This means that rivers need to be dredged and water pumped; and so they were for many years until the financial crisis of 2008, when cuts had to be made. For some reason the dredging budget was cut, and slowly rivers began to silt up.This meant that flood water did not run off very easily, and this year it has stayed put. The problems have been influenced by change in official thinking. For years Britain has tried to keep back the sea, but in recent times ecologists have realised that it is better to run with nature rather than fight it. There had been a change in strategy, with defenses being targeted on protection of residences, but these defences have failed. The niceties of ecology do not appeal to a resident whose house has been flooded for a month or a farmer who cannot reach their land. Officials have been accused of incompetence. The minister for the environment visited the villages and suggested that the locals come up with an action plan, but many pointed out that there were reports over lack of attention to dredging some time ago, which he had either ignored or underplayed. There is now pumping equipment in place draining water away and there is a plan to dredge some of the silted-up rivers. Too little, too late, say the angry residents, who gave the minister a verbal haranguing when he finally arrived in the villages. The villagers have displayed tremendous community spirit, supporting each other during this troubled period. They just want more support from the state,which they believe has not been as good as it might have been. Some observe that the area can only be saved by a wider attention to the land which drains into the Levels, making new drainage channels to take water elsewhere. This means that the floods have wider implications, both geographically and economically. What will become of the land as sea levels rise?. Many despair that it can be maintained in this artificial state, and even accept that the sea will reclaim its own. There is high ground, the ancient islands on which the villages now stand, but they might have to return to being islands. The farmers might have to return to seasonal use of the land, but some farmers have all their land on the floodable area. What will they do? Should the government take over the land, purchasing it from them? Maybe a new style of housebuilding will have to be taken up. 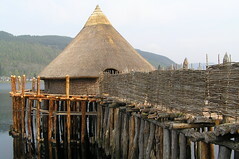 In ancient times there were Crannogs in Britain and Ireland. These were houses on platforms based on stilts, pile dwellings as they are known.We could have modern houses using the same design. One thing is sure: the present state of affairs cannot continue. Many of you will hve heard of the Levels years ago. If you are familiar with the story of King Alfred and how he burned the cakes, thisincident took place on Athelney [Athel's Island] in the Somerset Levels, which is where he was sheltering from the Vikings. Almost seventy! When I look at your picture you look younger than that. You must be doing something right. Ha ha! Frank, speaking as a woman of almost 70 with painful joints once I got up there I wouldn't get down again... still, it's a lovely idea. Wow. Very informative article, Frank. Thank you for sharing. These houses will have difficulties for the old, that's a point, but there might be no alternative. And I speak as someone of sixty three with painful joints! PS: Why aren't I following you? Must rectify that! This was such an interesting article. I was just thinking today that houses on stilts could be a good idea - bit difficult if you are getting on a bit though... I am going to Tweet this. Thanks Frank. Hi Frank, this was really interesting. That picture of the old dwelling is a nice touch. I'm pinning this to My Wizzley Writing board.